One of the most anticipated meets every season for the Roughriders is the Fargo Davies Eagle Relays. This meet features a number of relays not normally contested during regular track meets. In the field events and the three track events that aren’t relays (1600m, 3200m, 300m Hurdles), performances from each school are added together to form one team score in each event. It rewards overall team depth, as having one superstar in an event will not guarantee you team points at this meet. 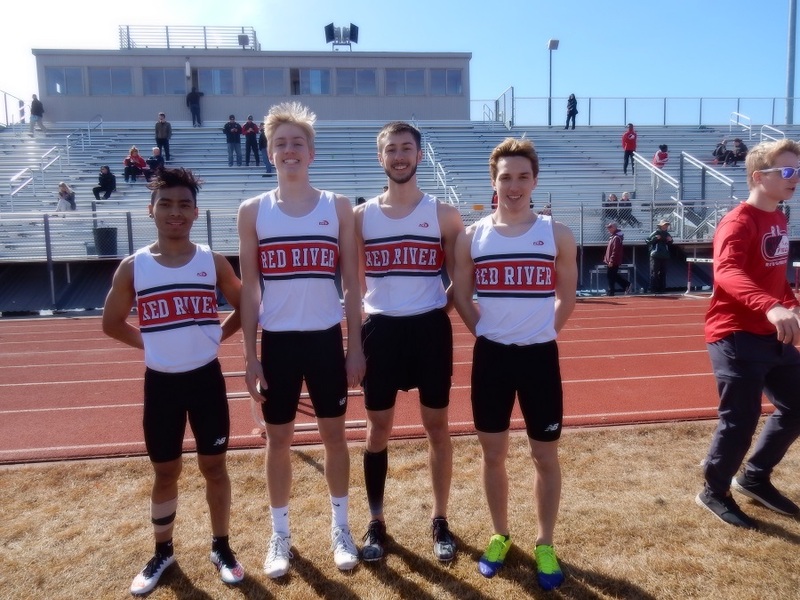 Since the inception of the Eagle Relays in 2014, the Red River Boys have won the meet every year. With heavy graduation losses and the addition of defending Class A State Champion Bismarck Legacy and Minnesota Class AA powerhouse Hopkins to the field, the pre-meet outlook for a Rider five-peat was bleak. Utilizing a full team effort and ignoring the hype surrounding other teams, the Riders amassed a total of 113 points by the meet’s end, eight points ahead of second place Bismarck Legacy. Only 14 points separated the top four teams, with Moorhead in third (102) and Hopkins in fourth (99). Kicking things off for the meet was the JV Mile, where twelve Riders threw down some impressive times. Four athletes set PR’s, while another five ran the distance for the first time. In the 3200m team race, the big highlight was the performance of senior Cole Stenseth, who finished second in a PR time of 10:00.41. The time is a state qualifying performance, making Cole the first official state qualifier of the 2018 season. Jake Arason also ran well to set a new PR of 10:23.88. Two relay teams hit state qualifying marks Friday, with the 4×100 team of Zack Topping, Tyler Burian, George Nyanforh, and Larry Pope clocking 45.34 and the 4×400 team of Pierson Painter, Burian, Stoker Short, and Nyanforh finishing in 3:34.08. In the field events, four athletes punched their tickets to Bismarck, headlined by three state qualifiers in the javelin. Seth Hanson (173’11), Liam Ogren (165’0), and Sam Schumacher (164’2), all returning state qualifiers, placed first as a team with all athletes bettering the SQ standard of 160’0. In the triple jump, Nyanforh improved his freshman record by reaching 45’4.5 to win the competition. He placed 5th at state last season. Other highlights for the Riders was the great display of team sprint depth in the 8x200m Relay. The team of Topping, Burian, Short, Painter, Brady Dvorak, Alessandro Kroeger, Josh Eagleton, and Pope ran 3:12.02 and set a new school record by over 2.5 seconds. One event the Riders have never lost at the Eagle Relays is the 4x110m Shuttle Hurdle Relay. Much like the team prospects at the beginning of the meet, the hurdle contingent was decimated by graduation and transfers at the beginning of 2018. Despite the lack of overall hurdling experience, the Riders still managed to stay undefeated by clocking 1:11.50 in the event. Team members included Bryce Enerson, Painter, Tanner Bernhardson, and Samir Bhujel. A bright spot was the performance of Painter, who hurdled for the first time in his life and still posted the team’s second-fastest split. A new twist to the meet was the final event, the Coaches Sprint Medley Relay. Sadly, the original lineup of 100-Baker, 100-Delmore, 200-Elfman, and 400-Tandeski never came to fruition after all four athletes forgot their spikes at the school. Heroically, coaches Eckert, Francois, Bakke, and Dafoe filled in. Never has the excitement level for a track event reached higher than during this fantastic display of dried up athleticism. Inspired by the frenzied cheering of athletes from all schools lining the backstretch, the Rider coaches put forth a valiant effort, but could only manage a fourth-place finish. Don’t worry folks, they’ll be back in 2019. While most of the team was able to compete at the Eagle Relays on Friday, a smaller group of athletes traveled back there Saturday for the Metro Invite. For most of them, it was their first outdoor meet and a chance to finally throw the discus or javelin in a meet. Junior Cade Johnson (138’3) and sophomore Cole Ogren (137’11) both set new PR’s in the javelin by over 12’ to highlight the javelin crew. Austin Oehlke (117’), Logan Arason (114’2), and Nick Jemtrud (109’1) all made their javelin debut and showed great potential. Alex Martin also set a new PR of over 15’ by throwing 103’11. In the shot put, Evan Hutchison (38’4.5), George Rerick (34’1), and Johnson (33’4.5) set new PR’s. In the discus ring, Rerick made the biggest splash with a 19’ PR to throw 91’2. Also improving his best from last season was Grant Richtsmeier at 85’10. Additionally, Khamani Steckler and Arason competed in the discus for the first time and set new standards for themselves. Meets this week include the Shanley Invite at Concordia College on Thursday. This meet will be highly competitive and each school will be limited to five athletes in each event. Those who don’t compete at Shanley can compete on Saturday in Hillsboro, where they will christen a brand new facility in their first home meet. As always, you can follow the team on Twitter (@RRTFXC) and Instagram (@rrtfxc).